At Berry Patch child care Wetherill Park, we are committed to creating a fun and secure learning environment for kids aged 6 weeks to 6 years. Guided by the Early Years Learning Framework, our preschool curriculum is filled with enjoyable activities and learning sessions that your kids will love. Our goal is to help your child achieve their potential at every stage of their development until they are ready to transition to primary school. Take a tour of our facilities and learn more about our play-based curriculum. Visit our childcare centre at Unit 38/2-4 Picrite Close Pemulwuy. 11-minute ride from Wetherill Park. You may also call us on (02) 9896 2662 or email us at megan@berrypatch.com.au. Our centre is open Monday – Friday from 7:00 am to 6:00 pm. To facilitate your child’s transition into primary school, we have created a play-based curriculum that puts emphasis on learning the proper mindset and necessary skills and attitude. Our goal is to focus not only on what they learn but also how they learn it. Our child care approach is guided by the Early Years Learning Framework outcomes and the Munch and Move guidelines initiated by NSW Health. We tailor our curriculum to include topics that are appropriate to the learning level of each age group. These topics are composed of literacy, numeracy and fundamental movements as well as others that are based on your child’s interests, strengths and needs. You will receive a developmental summary of their progress periodically as teachers complete them several times a year. You will also receive a comprehensive end-of-year summary containing our observations, developmental summaries and photos. At the end of the term during their 6th year, we will give you a transition to school statement to facilitate their transition to primary school. 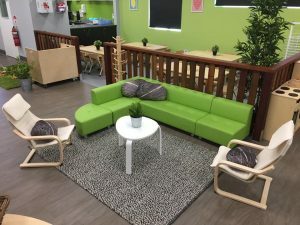 Meanwhile, our indoor rooms feature eye-catching and colourful flooring, furniture and decor that provides a stimulating learning environment. We believe the importance of colour and imagery to encourage the development of your kid’s creativity, problem-solving skills and critical thinking. Watch your tiny tots grow with confidence. Visit Berry Patch child care centre Wetherill Park at Unit 38/2-4 Picrite Close Pemulwuy for a tour. You may also call us on (02) 9896 2662 or email us at megan@berrypatch.com.au.